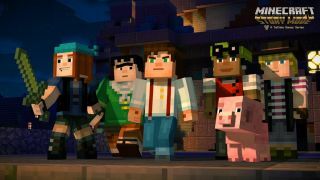 We got our blocky hands on Minecraft: Story Mode at PAX 2015. The fifteen minute demo, which included two sections of the game, featured some familiar elements from Telltale Games' The Walking Dead series, such as forcing players to choose which character to save and which to let perish. More of a departure is the inclusion of Minecraft's crafting table, which will allow players to dynamically fashion items to provide different ways of dealing with the challenges Story Mode throws at you. In the video above, our intrepid reporter Evan gives his impressions of the demo. Check out the rest of our PAX coverage here.